Purchasing fencing is an investment—it requires quite a bit of research. Before you buy, think about the factors that are important to you. Are you looking for something more protective or decorative? Cheaper, or more low-maintenance? Then, think about the different materials on the market. Aluminum fencing, popular for its similar appearance to wrought iron but light weight like steel, is a material many opt for. Today, we’ll weigh the pros and cons of aluminum fencing and see if it is the right option for you. Low-maintenance. Unlike wood, aluminum fences never require painting; unlike materials like chain-link or wrought iron, aluminum fencing will never rust. Plus, these fences are easy to clean! Inexpensive. Aluminum fencing is cheaper than materials like steel or wrought iron. And while aluminum fencing costs more than wood fencing, its low-maintenance quality may save you money in the long run. Versatile and decorative. With fencing, function is the highest priority, but form and appearance can be important, too. Besides, there’s nothing wrong with wanting your home to look nice! One of aluminum fencing’s biggest perks is that many products come in several shapes and designs to match or complement your home. And if you can’t find one you like, its posts and balusters are lightweight and flexible enough to be molded into a custom design for you. Easy to install and adaptable. Aluminum fences work great on any land—flat or sloped—without creating unsightly gaps in the fencing. And, similar to the above perk, their malleable quality means they can be adjusted to different heights to match local standards and building codes. Lasts a lifetime. Many manufacturers offer a lifetime warranty for their aluminum fencing products because they withstand wear and tear so well, outlasting wood, steel, chain-link, and wrought iron fencing. Environmentally friendly. Most aluminum fence products are made from recycled aluminum, requiring little energy to produce and reducing waste. Lacking in privacy. Aluminum fencing will provide a low-maintenance barrier, but it doesn’t conceal much at all. So if it’s privacy you’re after, you may want to think twice before purchasing aluminum fencing. On the weaker side. If you’re looking for a security fence, aluminum fencing likely won’t cut it—it’s not as strong as materials like steel. However, this may only be a factor if you are worried about large animals breaking in or out, or intruders. Still shopping around for fencing material? You might want to read our list of the pros and cons of vinyl fencing. So, what’s your stance? 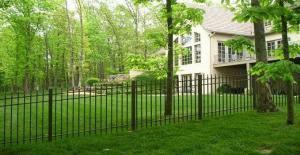 Are you now interested in purchasing aluminum fencing? If so, be sure to check out the selection MMC Fencing & Railing has to offer. Our store offers residential, commercial, and industrial fencing, as well as large gates, to suit any project. We also offer aluminum posts to tie it all together, and our manufacturer is happy to create custom designs for you. To get started, please visit our online store, request a quote, or give us a call at 1-866-931-5002. We look forward to hearing from you!